It's so tasty, versatile and inexpensive. It doesn't seem to smell as much as fresh fish and the oily fish (except canned tuna) retains all its Omega oil properties. So, it counts as one of your recommended oily fish portions. If you keep a stock of tinned fish in your store cupboard, you'll always have the makings of a quick, tasty and nutritious meal. Add some pasta or salad and new potatoes and you've got food on the table in double quick time. 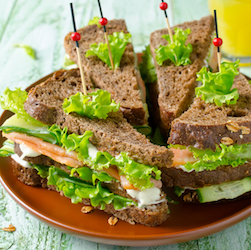 It's good to take a few cans on holiday if you're going self catering - you can make lovely sandwiches for your picnics - add some salad to them and they'll stay beautifully moist until lunch time. I use canned seafood a lot - I substitute canned tuna for meat in a tomato sauce to go over pasta or in a lasagne, enchiladas, quesadillas - have a portion of canned salmon with new potatoes, veg and parsley sauce, mash up canned sardines, mackerel or pilchards to go on toast, top with tomato and shredded cheese - I think they call it a 'melt'. You will never go short of good quality, tasty, economical protein if you have some canned seafood in your store cupboard. 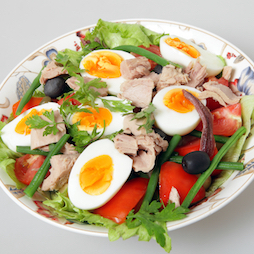 Nicoise Salad - tuna, boiled egg, green beans, olives, tomatoes all in a lovely vinaigrette. This is the perfect summer lunch - serve with some crusty bread to mop up the juices and you've got your meal on the table in double quick time. Some people add boiled new potatoes or cooked pasta to this dish to make it more substantial. It's a perfect appetizer too. You'll love this - you'll love Gennaro Contaldo who's demonstrating how to cook a wonderfully authentic Tuna Pasta - you can use spaghetti or linguine for this. It has capers, garlic, tomatoes, rocket, chilli and anchovies as well as the tuna. The recipe is for two, but you could so easily multiply this up for more. Serve with some crusty bread for the juices. Tuna Pasta Salad - has to be one of the mainstays of any cook's repertoire. You can use it for pot luck, lunches, teas, picnics, packed lunch for work or school - a snack - anything at all. There's loads of variations and this video shows you the basics. I like to add canned corn, chopped hard boiled egg, shredded cheese amongst other things, but the recipe can be yours which will adapt depending on what you have in the cupboard or fridge that needs to be used up. I think the main thing is, you need small pasta - so macaroni, bows, spirals, shells, that sort of pasta works best. Canned salmon - so versatile and tasty. 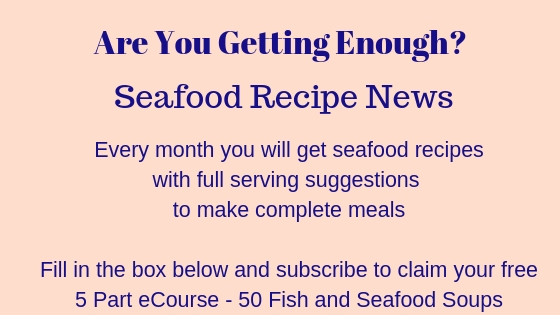 It's relatively inexpensive and counts as a portion of oily fish which we're told we should be having at least one a week! 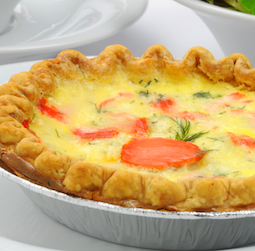 So, this link has three for the price of one - a Salmon Quiche - lovely tasty with cream cheese and sliced tomato. Great with some salad and new potatoes - or you could have it as part of a buffet meal. There's Salmon Patties (Fish Cakes) which are really easy to make and are one of the easiest ways to get the kids into eating fish. Salmon and Cucumber sandwiches - two ways, beautiful, tasty and quick to prepare. It just goes to show how versatile canned seafood is. Oh, and there's my own secret method of making short crust pastry - my Nan taught me and it never fails! Superb club sandwiches which I love to make with canned mackerel or sardines. It would be great with any tinned fish at all. Take any bits of bone or skin out that you don't fancy and then mash the fish with pepper and lemon juice to taste. Make sure you have paper towel or similar for people to catch the bits. I normally toast the bread to make club sandwiches as it makes the stack more stable and less likely to fall apart. 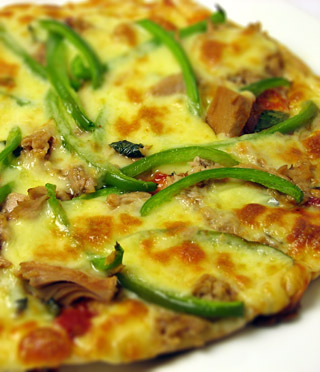 Seafood pizza using canned seafood - lovely. This recipe uses canned tuna *but* you can add anchovies, crab, shrimp, sardines - the list goes on and it could be fresh, canned or frozen. You can either make your own pizza dough or buy a ready made crust. You could use pitta breads or any other type of flatbread and make individual seafood pizzas. Great for a family meal or as part of a buffet. They're good cold and so would easily travel to a pot luck dinner. 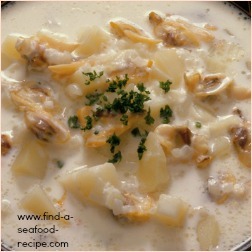 A Chowder Recipe using canned clams, mussels and corn. As always, you can use fresh if you prefer, but using canned seafood makes the preparation so much easier *and* you'll get it on the table in a much quicker time - what's not to like?? Serve this with some crusty bread to dip into the delicious chowder and make sure you get every last drop of the delicious broth. Now, a lot of people like to serve this for a Christmas Eve dinner - it's easy to prepare and the suggestions are serving with Sourdough bread, some leafy green salad and some sliced meats and raw veggies cut into strips for dipping with hummus or similar dip.